The McRobie name originated in Scotland in the late 1300′s. It is derived from the Scottish nickname Robbie, of the full name Robert. Mc (or Mac) is Gaelic meaning “son of.” So the first McRobbie was quite literally, the son of Robert. The first written record of the name is in the “Episcopal Registers of Moray” from the year 1636. His name was Maldowny McRobi. The McRobie family is a sept of the Clan Donnachaidh (pronounced “donna-key”) of Scotland. As of now, we are still searching for our particular link back to Scotland. 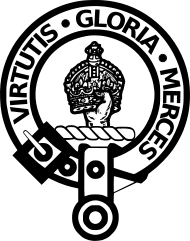 The Crest of the Donnachaidh Clan is a dexter hand holding up an imperial crown, proper.